Troop 39 was founded in the Spring of 1912 as Troop 1 and this Scouting year we are proudly celebrating our centenary. Troop 39 is one of the oldest, continually chartered Troop in the United States. For details of out centennial weekend activities see our flier. We will be celebrating throughout the year and wish to hear from as many Alumni of Troop 39 as possible. Alumni – take two minutes to join the official Alumni Google email list and join the official alumni register. In the Fall of 1911, the troop held what was thought to be the first ever Boy Scout camp in North Carolina. This was thought to be at Battle Park on the campus of the University of North Carolina in Chapel Hill. In commemoration of the birth of Boy Scouting in North Carolina, Troop 39 will be holding a celebration at the Forest Theater on campus. The event will include a service project for troop members, a celebration of the history of Scouting, an scavenger hunt across campus and a pig pickin’ for families and invited guests. 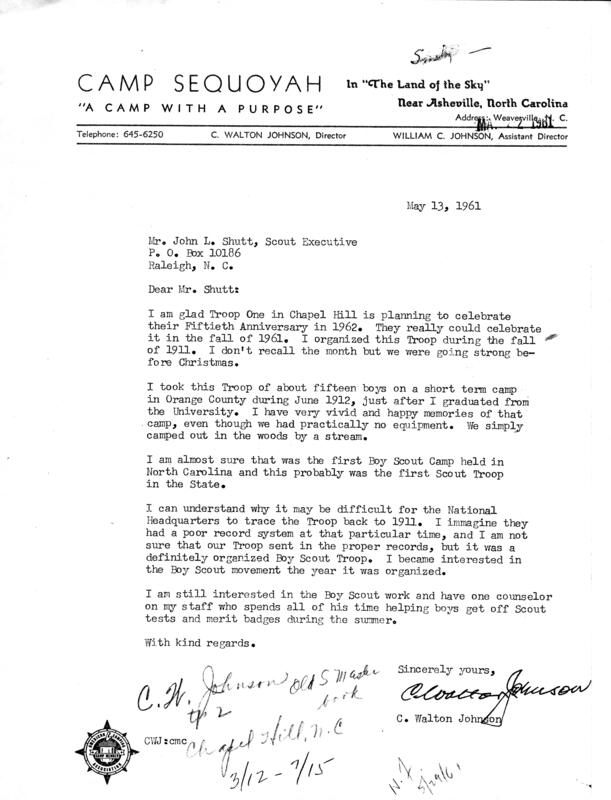 In 1912, the troop was formally chartered as Troop 1 by C Walton Johnson, the first Scout Master of North Carolina. 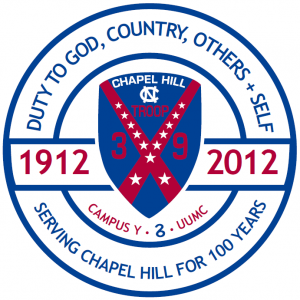 Unlike many troops which allowed their charters to lapse, particularly during times of war, the troop has been continuously chartered – initially as Troop 1, then as Troop 5 from 1925 and Troop 39 since 1937. These changes in the troop’s identity were due to the changes in councils and districts! 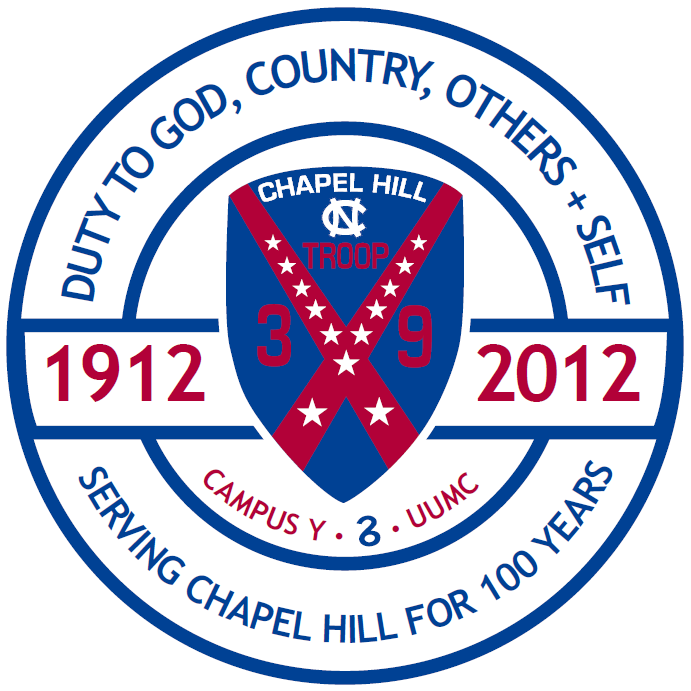 The Troop formally celebrating the centenary of its charter during the Memorial Day weekend 2012. We will have several events planned for that weekend including a gala dinner, an exhibit of troop history, an Eagle Court of Honor and an afternoon garden party. Details will be forthcoming soon on how to buy tickets however Alumni should register on our Alumni Google Group to be notified when details are available. Members of the press, please contact our webmaster.